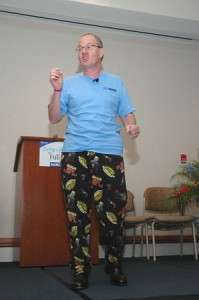 Monty Python pajamas I purchased for my prostate cancer surgery. Honest! Listen to this healthcare keynote speaker’s award winning short humor speeech Customer Service in San Quentin! Conor Cunneen is an Irishman happily exiled in Naperville where he says the Guinness is drinkable, he’s had more corned beef than he ever had in Ireland and the natives are friendly! Conor was diagnosed with prostate cancer early 2007. “There are a number of treatment options available ranging from radiation to prostatectomy, in other words the removal of the prostate,” he says in his light lyrical brogue. Contact Healthcare Speaker Conor Cunneen today. Healthcare Speaker Conor Cunneen will lift the spirits of any event that is looking for a speaker on healthcare / cancer / oncology / humor in the workplace. If you have a budget that would make any healthcare lobbyist drool as he liaises with The House Speaker, healthcare speakers you might look at include Lance Armstrong who is one of the most inspirational motivational speakers you will ever see. Other healthcare speakers include Entertainment Tonight host Leeza Gibbons who speaks on her mother’s Alzheimer journey; Senator Bill Frist is a nationally known speaker on healthcare. On the opposite side of the healthcare speaker rostrum you will find Governor Howard Dean. Getting those two healthcare speakers on stage might be an interesting session. Contact Chicago-based IrishmanSpeaks Healthcare Speaker Conor Cunneen today. Who is Keynote Speaker at Healthcare conferences ? Cross Country Healthcare, Inc. (Nasdaq:CCRN) announced today that it is scheduled to make a presentation on Thursday, June 24, 2010, at 2:00 p.m. Eastern Time at the Wells Fargo Healthcare Conference being held at the InterContinental Boston Hotel in Boston. These people beat it, Two Time Cancer Surivivor and Chicago-based Irish keynote speaker beat it and so can you. If you need help or advice, The American Cancer Society is a caring and generous group of people.